Punjabi Dinner Buffet At Rs. 295 Only is an event that took place on 14-Feb-2006 in Hyderabad. Chef Bahadur prepares to floor the audience! Hotel Green Park is celebrating the week with 7 different cuisines, one for each night, at its restaurant, Tulips. This Tuesday, the restaurant will carry a Punjabi buffet dinner, especially prepared by Chef Dan Bahadur, and priced at Rs. 295. 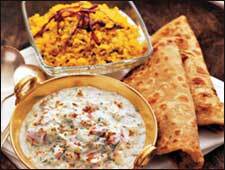 You can have an unlimited pick of Chhola Bhathuras, Daal Makhani, Tandori Chicken, Raajma and luscious Parathas. Please contact 5551-5151, 2375-7575 for further details. Be the first to comment on Punjabi Dinner Buffet At Rs. 295 Only! Just use the simple form below. fullhyd.com has 700,000+ monthly visits. Tell Hyderabad what you feel about Punjabi Dinner Buffet At Rs. 295 Only!